As we say goodbye to November to ring in the Holiday season, I would like to highlight some of the pivotal firsts that have happened at the Zoo this month. 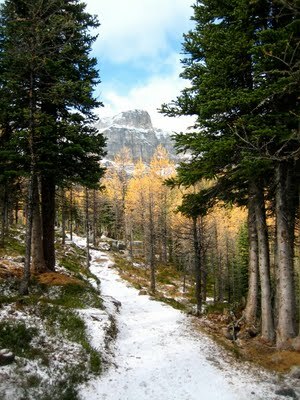 Never before has Street View been available on Zoocasa.com, never before have I been lost while hiking in Banff and never before has our team organized a Referral Promotion Program for real estate professionals. There is just something thrilling about venturing into uncharted territory! As Zoocasa is working with Real Estate Boards across Canada, to make it even easier to get agent’s and broker’s listings onto our site, we are introducing ourselves to many of you (industry professionals) for the very first time. From our presence at the RE/MAX 26th Annual Canadian Conference in Alberta to our participation with the Mississauga Real Estate Board’s 2009 Annual Trade Show, November has seen a decided rise in the number of you getting a first impression of us. With the support of industry leaders, like Elton Ash at RE/MAX of Western Canada and Michael Mills at the Mississauga Real Estate Board, we expect to see you all again next year. But in the meanwhile, we want to remind you that the Zoocasa team is working hard to market your listings. We are here to help and we are always happy to provide you with support when you need it. According to Ghyslaine Roy, a Realtor in Nova Scotia, first impressions are critical in real estate. To honour this philosophy, Zoocasa wants to ensure that you each have a great first impression of us. We want to do this by thanking you for joining Zoocasa.com! Welcome to all of our new users and for all of our regulars, we thank you for making our site the fastest growing consumer home search site in Canada.